The problem with watching American Idol is having to wait until 6pm Manila time watch it "live." Although it is not really live because right now it is only 9:21 in the morning and if I go to sites like rickey.org and MJ's big blog -- I really get the blow-by-blow account of the current episode. This morning I vowed NOT TO LOOK at these websites so I can enjoy the finale tonight. But I couldn't help but look. 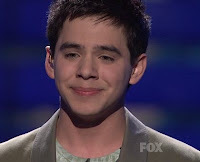 I am not going to say much but I will share a screen cap of David Archuleta all choked up. Thank you to Rickey Y. for sharing this picture. Makes me want to give Archie a big hug!